Table Top Glass Door Mini Fridge for Drink Promotion is designed to cool your drinks and perfectly promote them even in a very limited space. As you know, creative cooling is becoming more important as the promotion area at point of sale (POS) is getting smaller and smaller. Then here comes the questions to every brand promoter: How to stand out from the competitors within a compact area? How my brand will be remembered? And how to catch consumer’s attention at their first glance? The mini drink fridges made by Procool is a good answer of all above points. The front clear glass door with LED lighting inside is meant to display your beverage in a very attractive way. And never forget that the full outside body could come with excellent design with advertising effects. What is more? We create the glass door with engraved logo and highlighted by side LED with various colors. This stunning effect will capture consumers’ attention at first beginning for sure! Table Top Glass Door Mini Fridge for Drink Promotion is tested by the newest standards and approved by CE CB MEPs ETL NSF DOE SASO ErP and etc. We have close relationship with the certificate institutions and rich experiences in new certificate process with Low cost. Contact us freely for any inquiry. 1% FREE parts will be provided with the Table Top Glass Door Mini Fridge for Drink Promotion. And we promise to give you parts support at bottom costs throughout the lifetime. If any units break down and unrepairable (for example, internal leakage of evaporator), we will take full responsibilities and refund a brand new unit for FREE to our clients. Procool®: A designer, manufacturer and exporter of Table Top Glass Door Mini Fridge for Drink Promotion from China. We’ve got the most creative and cost-effective cooling solutions around, to highlight your brands and get more impulse sales! Our mission: to be your one stop solution supplier and long term partner in cooling. What Can We Do for You: customization, stable quality, fast delivery, competitive costs, low MOQ, attractive branding, shipping and more. Why US: professional industry experiences since 1998, sold in over 80 countries and trusted by 100+ brands. 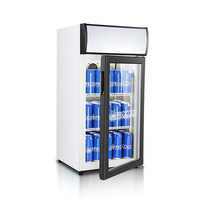 Our Table Top Glass Door Mini Fridge for Drink Promotion is trusted by more than 100 brands globally. Just hear out some of the voices from our customers. Can’t find the exact model you need? Kindly contact us freely, we have more models not shown on the website. Also, we have strong R&D team and flexible tooling to custom manufacture for you.